In our world where there are thousands of brands and hundreds of products, it’s very difficult to find the best work boots. They are the arguably most important part of personal protective equipment and have a direct effect on your entire body. For example, improper footwear can cause foot, ankle, knee, and back pain. You’re going to be spending many hours on your feet and will be exposed to many different hazards. If you’re not using the proper safety wear you may find yourself uncomfortable, out of a job, or injured. According to the U.S. Department of Labor, 13% of all injuries occur in the ankle and foot. Of those injuries, the average amount of lost work days is nine. Don’t become a statistic, get yourself a pair of good work boots. 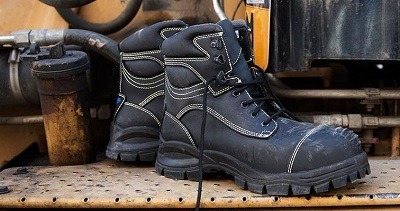 I’ve done the proverbially ‘heavy lifting’ for you and compiled a massive resource detailing the best safety boots for most jobs, sports, and hobbies. Before we get into the work boot reviews, I’d like to take a moment to look at all the factors and information about these boots so you have a better understanding of what to expect and look for. Hard workers need a strong boot to support them, and finding that perfect fit isn’t going to be easy. It might take a little bit of research, and it might even take a little bit of time (much more than it usually takes shoe/boot shopping). This isn’t about the looks, it’s about the value that these boots are going to hold when it comes to your working patterns. The different work industries of the world will call for different needs when it comes to your boots. For example, if you’re a construction worker, you will want a boot that will keep you comfortable standing on concrete for extended hours, durable enough to withstand the demanding hours of the job, and safe enough to protect you from falling objects, electrical lines, and water. Safety without a doubt should be the top priority in the workplace. Every company has a set of standard regulations that are there for a reason(likely because someone(s) have already injured themselves). Earlier I quoted that 13% of all workplace injuries occur in the feet and ankle. 100% of those injuries could have been avoided with proper footwear, planning, and execution. Having a safety toe is typically the bare minimum to look for in the best safety boots. There is also metatarsal guards, heat guards, oil and slip resistance, and insulation. Each of these has a specific purpose to keep you a bit safer. Of course not every job requires you to have all these features, but it’s good to know about them. By using the best steel toe work boots you are also reducing the risk of falls, lacerations, crushed toes, blisters, and calluses. Also, understanding that your boots won’t fail you when you need the most gives peace of mind. The most comfortable work boots will allow you to perform to your full potential, you won’t have to feel like you’re not helping out around the shop (or wherever it may be). Your team needs you, and aching feet are only going to make things worse. When you find the perfect fit (no pun intended), you’re going to realize how much of a difference it can make in your routine. You can have self-confidence and relax because there’s no need to worry about having the wrong work boots on your feet. Toes are precious for workers regardless of their industry, so keep them intact (and at their peak!). Quality boots need to be durable. They’re meant to handle the rugged nature of working in harsh environments with plenty of hazards. I don’t know about but I can’t afford to buy new boots every six months. They need to be able to last years of heavy use if they’re going to be economically viable. So save yourself money in the long run and purchase a boot that won’t break down at the first sign of hard work. These are the three main traits to look for when in the market for new boots. All the boots I recommend have been tested, reviewed, and retested to ensure they are top-notch and excel in all categories. Don’t just buy the first pair of boots you see, odds are they are overpriced or will fall short in these categories. Please us my site for all your work boot queries. 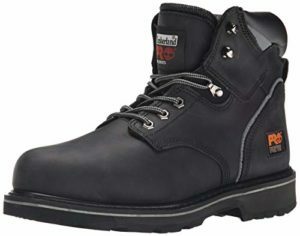 Which top rated best work boots are the best fit for me? Before you begin looking at the boots, think about what your job entails. Are you walking around a lot? Are you working around lot’s of moving and heavy equipment? These are the types of questions you need to ask yourself and pick a boot that correlates to your unique needs. So, consider the field you work in and what an average daily routine looks like. A construction worker is going need a boot that’s a lot different than a fisherman. No matter what you’re searching for – we’re going to help you find it! Your needs can be applied to your search, and if you aren’t sure what you need to make use of we can help you out. You will be wearing them every single working day, so keep that in mind before you decide to make that final purchase. If you need any help picking out a boot, please leave me a message and I will get back to you promptly. If you work in the cold constantly you’ll need quality insulated work boots. They promote warmth and comfort without adding extra weight. You can have that extra little bit of insulation to make sure your feet are always warm. Feet are one of our most susceptible areas to the cold. Pair a good insulted boot with thick socks and you should be fine even in the most demanding cold environments. We’ve all had a job that threw us into the wet and mud at one point or another, and the good work boots around will always be waterproof. Wet feet are debilitating and will quickly end any work, sport, or hobby that you are participating in. Most boots claim to be waterproof but few can actually hold up to that statement. Wet feet at work is absolutely terrible, so don’t let it happen to you. There are waterproof creams and such available as well if you’re interested in that, as they tend to work relatively well. When you’re in a slippery work environment, there’s a constant risk of getting hurt, which is why certain work boot regulations are in place. Having tough out-soles with good grip is incredibly important. Slipping and falls are the top reason for injury in the workplace. Don’t become just another statistic. Foot problems that persist through the use of low-quality work boots should never be up for discussion, it’s about time that you invested back into yourself (and how great you can feel at work). In most situations, there is very little difference between composite and steel toe boots. Steel toe is more of an industry standard and it’s cheaper to produce and easier to find. Composite toe boots are rarer and typically have a slightly higher price-tag. As far as strength goes they are comparable and have no real difference. There are two reasons I prefer composite toe to steel. Firstly, steel conducts temperature very well. This is bad if you’re working in a cold environment where the steel will get cold and stay cold. Composite toe doesn’t conduct temperature well and won’t heat up or cool down your boots. Secondly, composite caps are considerably lighter than steel. While a couple of ounces doesn’t sound like a lot, over the course of an entire work day, it makes a large difference. 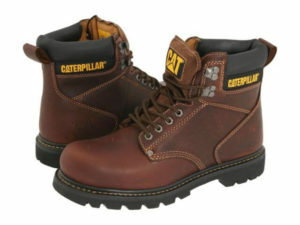 Caterpillar (sometimes referred to as “CAT”) is a well-known brand that produces work attire. They’re a brand that’s quite commonly trusted, as tons of working men and women rely on them for their high-quality products. They’re well-known for not only being the producers of the most comfortable work boots around, but also the most durable. They’re built to last and that’s something you really need to see in a work boot or even work shoe, especially if you plan on keeping the pair around for a little bit. This particular pair of work boots is equipped with a smooth black leather foot, under a matching and genuine (respectively). There’s also a 6” lace-up leather shaft and padded collars to make sure that your comfort is taken into account. The toe is rounded and there’s a single stitched Goodyear welt, and it can be purchased in the reinforced variety as well. The sole is 6”, and some prefer a sole that’s a little higher or lower; personally I feel like this is the perfect height for just about anybody. It’s built for hard working people that are going to be wearing it all day, and the full-grain leather allows your feet to breathe. If you want a tough pair of boots that are going to keep you comfortable as well, this would be a perfect choice. The name is a mouthful, so they’ve got to be good, right? That’s exactly the case in this situation, as we have another pair of Timberland’s making the top 3 list. These ones are a bit more expensive, but they’re definitely worth every single penny you’ll be dishing out. 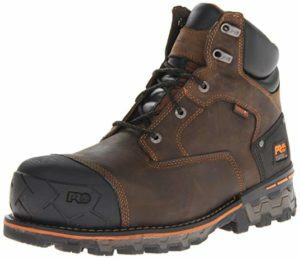 They’re made with genuine leather and all of the other good stuff that makes its way into other Timberland work boots, but it comes with a little extra as well; hence why the price is so much higher than the others on this list. It’s got a composite toe, which means it’s made up of a non-metallic material (one that’s ASTM-rated, of course). There’s also electrical hazard protection, which is an absolute must if you’re working in high voltage settings. The last thing you would want is to get electrocuted on the job, and these are the best work boots to stop that from happening. The lightweight design makes this otherwise large pair of work boots as light as possible, a trait many other work boots fail to provide. These boots are fantastic for just about any season, and they’ll fit almost every single need you could ever have. That’s it, these are my favorite best work boots reviews! Shoosly.com is a participant in the Amazon Services LLC Associates Program, an affiliate advertising program designed to provide a means for sites to earn advertising fees by advertising and linking to Amazon.com.